Following the initial consultation on the plan’s objectives, the first major breakthrough for proponents of sustainable and active travel was the outcome of the focus groups. The county’s settlements have been sorted into four catagories; Oxford City, Large Towns, Small Towns, and Rural. Focus groups representing each of these settlement types were asked to prioritise the objectives and every group rated the main cycling and walking objective as a “High Priority”; the only objective to be rated a high priority across all of the settlement types. Not only that, the objective was strengthened to say “Develop and increase cycling and walking for local journeys, recreation and health”. The rating of all the objectives can be seen in the county’s Background Document. Now we’ve emerged from the rather boggy “Lists of Schemes”, the consultation has blossomed into some broad choices of how we want our communities to look. Three “scenarios” have been developed for each settlement type, each supporting the objectives but with a different emphasis on them. It’s not perfect, it can’t be when you have several different settlements with differing history and physical layouts being lumped in the same category, but the choices give a firm indication of what you consider to be the most important outcome. There’s the opportunity to qualify that choice with additional information, and to proffer preferences of how the objectives might be achieved. Eg, this is an ideal opportunity to point out how beneficial a town wide 20mph scheme would be to improving cycling and walking in the town, and hence health, for what is in transport project terms, peanuts. This scenario would bring considerable local economic benefits through reduced congestion and delays and would also benefit local air quality. In addition, controls on vehicles could be introduced to further promote better air quality. Opportunities to walk and cycle around the towns would be significantly improved. The scenario would be likely to bring health benefits and also enhance the natural and built environment of the towns. This scenario would significantly increase opportunities for travel by bus and some improvement for trips on foot and by cycle. It would also help the local economies by reducing congestion. There may be some environmental costs to the landscape from this scenario, especially if new park and ride sites are built or extra road space was needed to provide bus priority, but this could be minimised by careful planning and design. This option could support growth and economic potential across the county and improve the local economy by significantly reducing delays on local roads and increasing access to jobs and services. This would bring direct improvements in congestion and accessibility leading to local economic and environmental benefits where traffic is removed from town centres. The scenario could also improve air quality in some of the towns although it is likely to lead to an overall increase in carbon emissions across the Larger Towns. There is likely to be some impact on the environment and settings of the towns, although careful planning and design would seek to minimise this. The Local Transport Plan has already been significantly influenced by the responses of the public so don’t underestimate how much your opinion can shape the future of sustainable transport where you live. The county’s officers working on this project are honestly interested in your views. I shall be encouraging everyone to respond to the consultation with another blog nearer the consultation deadline of 20th June, and I’ll take a closer look at the scenarios for small towns and the rural villages. I’m happy to field questions – I was struggling a little to get my own head around this part of the consultation, until I went along to the drop in session at the Corn Exchange and had it explained to me. 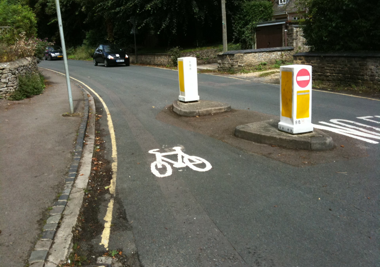 This entry was posted in WitneyBUG and tagged bikes, planning, words on Thu 20 May 2010 by kevin hickman.